There is a new standard for collaboration in the cloud—fast, fresh and dynamic solutions. That’s why we’re so excited to announce the TaskRay Live App for Quip’s next-generation productivity suite. Whether you’re onboarding customers, building new technologies, or designing marketing campaigns, having clearly defined stages and a reliable guide is critical. When it comes to project management, it is not uncommon for multiple projects to be running simultaneously. So, let's talk about the big picture. With all the buzz around the TaskRay August 2017 release, you might have heard about the all-new Task Groups that can be used to structure your projects. Task groups were introduced to allow grouping and organizing tasks within projects into phases, themes, sprints, or other ad hoc attributes that are relevant to the project at hand. Reporting Woes - Or is data accuracy really that important? First things first, I'm kidding, we all know that 100% data accuracy is the elusive white whale in the Salesforce ocean. May we all be known as Ahab when we retire. When I first started with Process Builder, this error drove me crazy. I have no idea where my process broke, based on this error message alone. If I had a dollar for every person who asked about Field Sets, I could buy a If I had a dollar for every person who asked about Field Sets, I could buy a remote controlled tarantula.. This release will include two new Files tabs in Project and Task Details, automatic file copy on project template clone, and redesigned Team and Bulk Action features. 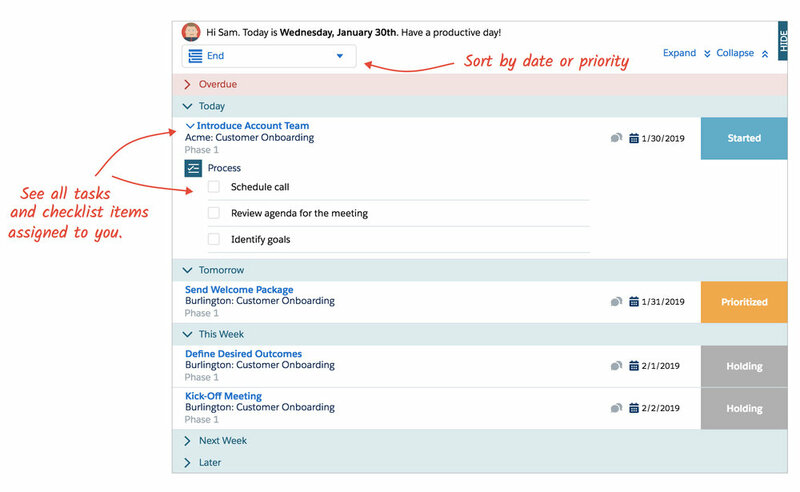 The release will include the new Calendar View, functionality to create a task Agenda, dynamic task sorting options for the Kanban View, as well as file sorting capabilities. Slack is a cloud-based team collaboration tool, and TaskRay is a cloud-based project management tool. They truly complement each other and help people get more done, more quickly and in a more fun way than ever before. With our August Release, we are taking project data visualization to the next level. The new left sidebar allows you to quickly access project data by five new default views - Inbox (My Projects + My Tasks), My Projects (My Projects + All Tasks), Favorites (Starred Projects), Delegated (Tasks I Created and Assigned to Others), and Recent Projects (5 Most Recently Viewed). On the heels of TrailheaDX and the Summer 2016 Salesforce release, TaskRay is happy to add three new Components to our existing library. Our product development team is excited to continue their trailblazing work on Lightning Components for TaskRay.